McKnight made that remark when he was chairman and CEO of 3M. I selected it to serve as the title of this brief commentary because it correctly stresses of establishing and then nourishing a workplace culture within which personal growth and professional development are most likely to thrive. It is no coincidence that most of the companies annually ranked among those that are most highly admired and best to work for are also annually ranked among those that are most profitable and have the greatest cap value in their industry. Presumably Rob Goffee and Gareth Jones had all of that clearly in mind when selecting the abundance of valuable information, insights, and counsel they provide in this book. Their primary objective is to help as many executives as possible to help their organization to become or remain “authentic.” More specifically, “In our research we found three characteristics that seem to consistently differentiate what we regard as authentic organizations: they possess a sense of identify; they obsessively live their values; and their leaders model the company’s values.” Over the years, it has been my pleasure as well as privilege to work closely with the leaders of several such organizations and I can personally attest to the authenticity of those three characteristics. They have a culture within which personal growth and professional development are most likely to thrive. 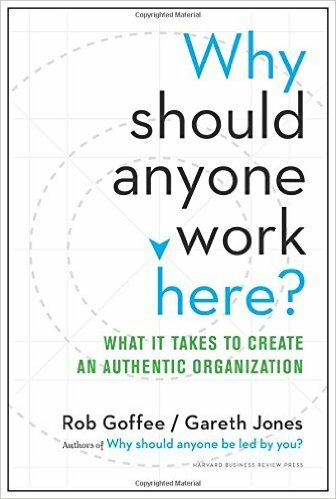 I commend Goffee and Jones on their skillful use of several reader-friendly devices, notably “Action Points for Leaders” and “What Organizations Can Do” sections in each of the first six chapters. This material serves three separate but interdependent functions: It stresses the most important take-away points, it creates an interactive relationship between the reader and the material; and finally, it facilitates, indeed expedites frequent review later of the material that each reader deems most relevant to the needs, resources, and objectives of the given organization. Goffee and Jones also include seven diagnostic exercises with regard to differentiation, radical honesty, adding value, standing for something real, meaning, simple rules, and authenticity. Shrewd readers will highlight key passages and will also have a lined notebook near at hand in which complete these assessments (or notes they evoke) as well as to record questions, comments, page references, and reminders. Obviously, no brief commentary such as mine could possibly do full justice to the valuable insights and counsel that Rob Goffee and Gareth Jones provide in this book but I hope that I have at least indicated why I think so highly of it. Consider their concluding remarks: ” Take a close look at your organization and ask the all-important question: Why should anyone work here?” If you are uncomfortable with your response, seize the opportunity to apply what you have learned from this book and enlist others to join you in collaborative efforts to make your organization one that you want to work for but also one that attracts others who can help it even healthier. Channeling Hillel the Elder, I add my own questions to ponder: If not now, when? If not you, who?